Hi, my name is Matt Nagy. I am the owner here at Mighty Mountain Honey Farms located in Lumby, British Columbia. I have been in the honey bee industry going on 17 years now! I became fascinated with honey bees when I was 12 years old. I was walking around at the IPE in Armstrong BC, and they happen to have a honey bee section in a trailer. I walked into the trailer and knew at that moment, bees was going to be a passion of mine. Little did I know, it was going to be more than just a passion. Now 17 years down the road, my passion has grown into a commercial Honey Bee operation. We currently run over 300 plus colonies and expand hugely every single year. 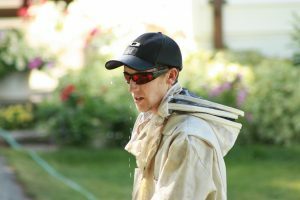 We specialize in supplying pollination hives; delivering to the local orchards, pollination peaches, cherries, apples, and apricots in the Okanagan Valley. Blueberries and raspberries in the Fraser Valley. We also specialize in supplying starter hives, known as nucs, and starter equipment kits to get you started on your own honey bee apiary.